Uniquely located in downtown Danang, on the beautifully-designed West Bank of the Han River, the Novotel has taken its place as a leading hotel venue for both business and leisure travelers. 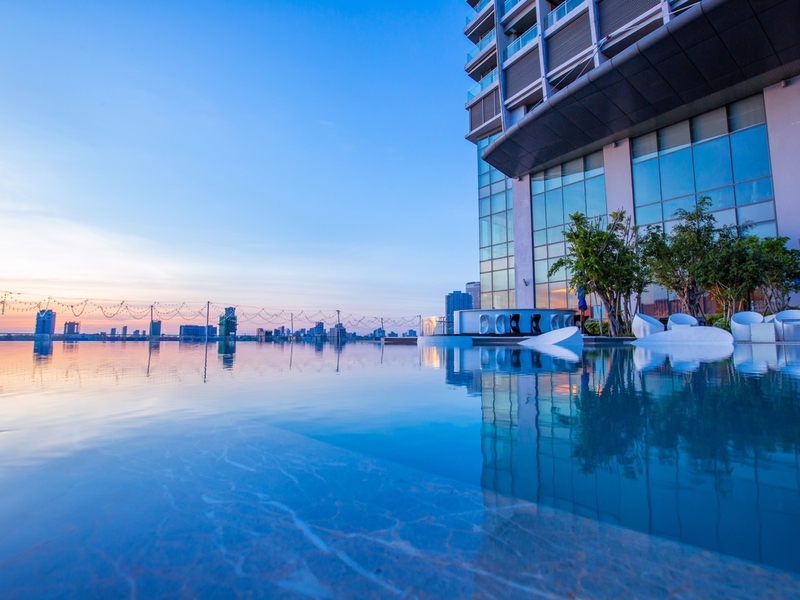 It is Danang's first upscale internationally-managed hotel with serviced-apartments, with the highest and hippest panoramic bar in the city alongside world-class facilities and restaurants. So be it business or pleasure, know that at the Novotel Danang, our professional staff are looking forward to welcoming you. Novotel is Danang's first upscale internationally-managed hotel with serviced-apartments, with the highest and hippest panoramic bar in the city alongside world-class facilities and restaurants. Uniquely located in the heart of Danang City, next to Danang Administration building. Easy access to tourist attractions and international airport. Top 10 among 384 hotels in Danang on TripAdvisor. Majority of the rooms with a balcony offering an unrivalled panoramic view of the city. Regardless of one's reasons to visit, whether leisure or business, we are confident that our excellent amenities and open-concept rooms will suit everyone's needs. Modern and spacious, all rooms at the Novotel Danang Premier Han River are specially designed with comfort in mind. 1 bedroom Apartment, fully equipped kitchen, Video and HiFi music system - 51 m² / 549 sq.ft. Step in the Square to experience a lavish breakfast buffet each morning. Then as the sun sets, the restaurant transforms to offer theme buffet prepared live by our talented chefs in sparkling open kitchen and once a week seafood extravaganza night. The casual atmosphere of Splash is perfect for relaxation. An excellent place to sip a tropical cocktail and mocktail while taking a deep in the pool. Splash will feature food and beverage selections on inflatable floating menus, "Frisbees". For business or friendly gathering, Gourmet Bar offers creative cocktails, large selection of beverages, inspiring dishes of the day, epic burgers, addictive tapas and delicious pastries. Good Location Hotel with good Sky bar "SKY36"
Nice hotel with good location and good sky bar at top of the hotel. But the hotel apartment building has some bad smelling like new painting. The towel & pillow in the 2 bedroom suite apartment on first night also has bad smelling. Probably it has been clean and room set up for a some time with out customers. - The dining is perfect - Attitude and capacity of each employee are beyond description. Very special. - However, room was not clean enough, comparing the name of Novotel. Dust on the floor, dirty things in the restroom. My noses were not nice throughout my entire staying. Everything is good, but if you don't like noisy, dont stay at high floor because there is Sky36 bar so the music from there quiet loud. As accor member the hotel upgrade my room and we can enjoy executive lounge. Special thanks to the manager. we came n stay with 2 couples with 2 rooms, from first day until last day, all the staff very very friendly and helpfull, the breakfast also good, the view is very very good, the location also very good, at the night you can walk arround the River with so beautiful view, clean and safe also, and so many cafe and resraurant you can find, great location. Thoroughly enjoyed this Novotel hotel. Good location, great breakfast, friendly, helpful staff. I have only one world: &quot;Relatively&quot;, not better than previous two or three years. Buffet breakfast was freshly delicious with tons of cuisines to try from. Lobby cafe-bar serves better-made fruity and sweet drinks than most similar cafes in Ho Chi Minh City where I live. Lobby door staff helped us with 2 excellent local &quot;bánh tráng thịt heo&quot; and &quot;bún mắm&quot;, which were not the tourist famous restaurants but absolutely authentic local places. We were so happy with his helpful recommendation! Pool was under maintenance. But sauna/steam room was fairly clean. Gym looks nice, my first time walking on the treadmill but it was pretty easy to use. Amenities did not include facial cleanser, moisturizer like the 3 star business hotel I stayed in Japan-- which is probably only a cultural difference thing. Water temperature didn't work properly due to maintenance but was not noticed at check-in, but after I asked it was all fine later that night. Latin music on TV set was surprisingly well selected! Helped me relax on a Friday night quite noisy outside (I heard the rooftop bar was quite loud from other upper floors). Thank you. Nice welcome, very helpful staffs who gave us many advices about location, foods.. Comfort bed, clean room. Pity that could not use the pool cause by under renovation or something. Good sauna and gym too. Very nice breakfast with many option. This trip marked my return to Danang city after 5 year break and thanks to your dedicated staffs, I have an amazing experience. I felt well-responded since the time I made group booking, thanks to Ms. Mia & sales team. Front desk team had done a very good job on welcome my group eventhough it was quite crowded at that time, we all felt well-greeting. My conference meeting would not be so successful without the high dedicated support from Mr. Khanh & his staffs, thanks for his supports & arrangements even it's in his day off. Last but not least, let me express my appreciation to all the other staffs which I missed to get to know the names, thanks for all your efforts to contribute into the amazing trip which I had. The staff were amiable and helpful. I had a pleasant stay. Location is good and I love the beautiful view from my room. Specially thank you for the birthday cake! I will come back in the future. Firstly i really want to say thank you to the guest relations manager Tina , Thien and Bang from concierge one more time, both of you made my trip so unforgettable! I booked this hotel because i had discounts, I try to request something special as this trip meant so much for me. I was suffering cancer and lying in the hospital in Mar 2018. It’s a trip to celebrate I already recover for a year. Tina arranged the detox water, sweets and a free foot massage to me, I really appreciate everything she did for me. And i wish her baby with good health and happiness as same as she bless for me. The smiling face from Thien brings me a good start daily, and Bang and Thien provides me a very personalised services. Keep it up! I will come back again definitely! Dear Mr. K., We sincerely appreciate you taking the time to pass your feedback regarding your recent stay at Novotel Danang Premier Han River. It brings us much pride to recieve your kind words regarding the breakfast in the hotel . We are continually trying to improve the variety and quality of food items that we offer. Please rest assured that your feedback has been shared with our team and it would serve as an encouragement to all of our staff. We all look forward to welcoming you back to Novotel Danang, where we would have chance to create another satisfying and memorable stay for you. Warm regard, Tam Hoang Guest Relation Manager. We had an absolutely fantastic and amazing stay at the Novotel in Danang. The staff were so friendly and this applies across the entire range of services, from the front desk, to waiters, bar staff, cleaners and management. Our room was clean, extremely comfortable and with a fantastic view of the Han river. The food was excellent and delicious. We enjoyed the free shuttle bus to the beach resort as well as to the airport. Great service and we cannot fault anything!